Sometime around a million years ago, Homo Erectus figured out that his discovery of fire could be used to cook meat. 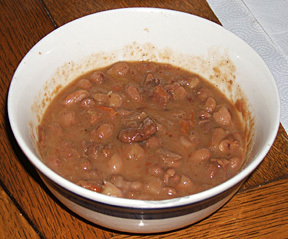 Besides the increased survivability cooking offered in terms of disease reduction, the softer food could be chewed by even the weakest members of the tribe. It was simple. Just skewer the day’s kill onto a stick, roast, and eat. 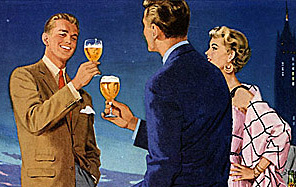 We can only speculate that early man also had the faculty to appreciate the flavor that only fire can impart. Fast forward about a million years into the future (minus about 50 or so) and we arrive at a time when this iconic technique is identified with a society that reached the pinnacle of outdoor cooking…the Patio Culture. 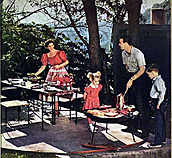 Mid-Century grill men took what was primarily a Mediterranean cooking technique and brought it into the American mainstream. As stated before, the simplicity was undeniable. This, however, gave the chef little opportunity to express his individuality. 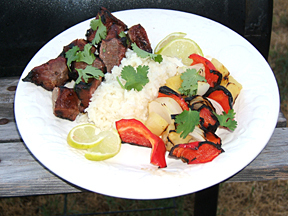 To get around this, outdoor chefs discovered they could create marinades to alter the flavor of the meat and add various vegetables to make an otherwise mundane dish spectacular in both taste and presentation. The following is intended to be a generalized overview to guide you through the sheer diversity of kebab variations. To begin your foray into the world of kebab grilling you’ll first need decent skewers. 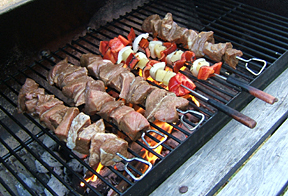 As traditional Middle Eastern grill men know, the flat sword type skewers are preferable as they keep the meat and vegetables from spinning around on the skewer. They should be long enough so that the handles can remain a somewhat safe distance from the heat source. Bamboo skewers are good for smaller individual servings, but be sure to soak them for 30 minutes prior to putting them on the grill. As always, a bed of glowing coals (charcoal or otherwise) rather than a blazing fire is the cooking environment you’ll need. Unless you have access to some prime beef such as Kobe, you’ll probably need to marinate the meat. 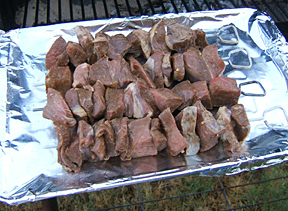 This is especially true if you’re using typical cuts of stew meat, a popular choice for American style kebabs. The simple chemistry of a decent marinade is one part acid (lemon, lime, vinegar, etc.) to about two parts oil…similar to a vinaigrette. To the marinade base you can add just about anything. Common ingredients include, but are not limited to, chopped onions, garlic, Worcestershire sauce, soy sauce, even honey (use care with sweet ingredients as they can easily burn on the grill). Time is the next factor. Marinade the meat for at least 4 hours with overnight being even better. 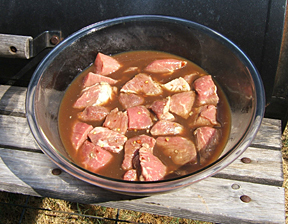 Mix all ingredients together and marinate meat overnight. When the meat has had time to properly marinate, pat dry and begin threading onto a skewer. Here’s where I differ from traditional kebab techniques. I prefer to have skewers with only meat, and separate skewers devoted to the vegetables. 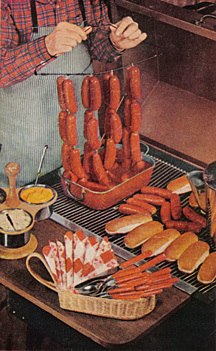 The simple truth of this is because it takes longer for the meat to cook than the vegetables. If you want to go with the more traditional approach, alternate meat and vegetables, but watch them closely to make sure they don’t get overcooked! The old standby veggies such as bell pepper, onion, mushroom, and cherry tomatoes are great, but don’t feel limited to those choices. Any vegetable that is somewhat firm can be used, as well as, fruits (pineapple being my favorite). 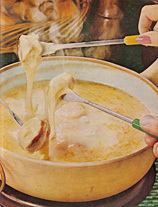 In a metal pan (one you use for your smoker), melt the butter and mix with the wine. 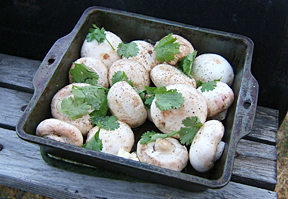 Add the mushrooms to coat well and top with salt, pepper, and cilantro. Simmer on the back of the smoker for about 45 minutes or until mushrooms are soft. Great side dish for any barbeque. These combinations of marinades, meats, fruits, and vegetables work best when they follow at least some semblance of a flavor theme. 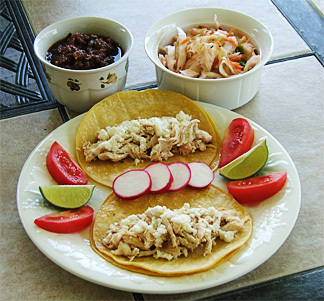 For instance, traditional (as stated above), Asian (soy sauce based marinade and fruits served with rice), Mediterranean (using lemon and olive oil marinades served with couscous), and Mexican (roasted meat for tacos al pastor, and grilled green onions on the side). 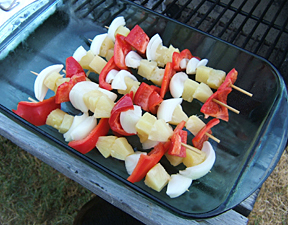 With your coals ready, load the skewers onto the grill and cook for about 10-15 minutes being sure to turn often. A little vegetable char on the mixed kebabs is OK but a light coating of cooking spray helps with this. Serve the entire mixed skewer for show, or de-skewer the meat and vegetables, combine, and serve over your choice of carbohydrate. Again, it’s up to you but rice pilaf or couscous are the most common.